Truro City could move to a new ground on the outskirts of the city. Helical Retail, who want to redevelop Treyew Road, have bought a site known as Silver Bow at Threemilestone. A planning application will be submitted for the new ground, which is four-and-a-half miles away from Treyew Road, in the coming months. "The acquisition and development of the Silver Bow site will create long term certainty for the club to implement its plans," chairman Peter Masters said. 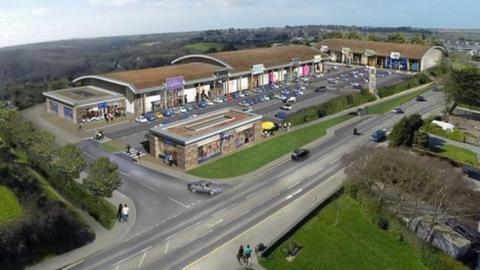 Truro agreed to sell Treyew Road to Helical last July and the firm plans to build a retail park on the site. The club are currently third in the Southern Premier League and were taken over by Masters and fellow businessman Phillip Perryman in December 2012 after the club went into administration earlier that year. They were relegated at the end of the 2012-13 season, but have since stabilised under new manager Steve Tully. "We can now put the uncertainties of the past few years behind us and focus on our plans to build a new stadium for Truro City Football Club to Conference standard, whilst incorporating a youth academy to channel young footballers throughout Cornwall into playing at the highest level," Masters added. The Silver Bow site is opposite the proposed Langarth housing development, which has planning consent for 1,500 homes. "It has always been our plan to provide an alternative playing pitch for Truro City," said Helical managing director Jonathan Cox. "This definitive action demonstrates Helical Retail's financial commitment to not only delivering a much needed retail scheme for Truro, but also to ensuring the long-term future for the club."